Do You Play Too Cautiously When Coach is Watching? When playing a pick-up game, many players are able to be themselves, play relaxed and perform to the best of their abilities… but this can change when coach is observing…. When the coach is watching, some players fret. It is like a switch goes off in their head and they become a totally different player. All of a sudden, these players become petrified of making mistakes or not performing up to coach’s expectations. They fear they might lose their starting role on team, get less playing time, or face the wrath of their coach. This fear of a coach’s evaluation changes your focus from playing soccer to the negative mindset of fearing what your coach thinks about how you play soccer. This fear of a coach’s evaluation is overwhelming for some players. If you do this, you become anxious, make uncharacteristic mistakes, and play cautiously. Thus, you take less risks. This problem is no different than the one facing the USMNT during the Jurgen Klinsmann era. Klinsmann has tinkered with his lineup through the past several years. During a recent World Cup qualifier, U.S. coach Jurgen Klinsmann inserted five new starters into his lineup against Guatemala following a 2-0 loss the previous week. Klinsmann, in some players’ eyes, has given preferential treatment to four German-born players that he recruited to play for the U.S. This sends a very clear and specific message to some players… Don’t screw up! You would be nervous… You might not take as many risks on the field for fear that those risks may not pan out… You would be focused on trying not to make mistakes instead of focusing on making plays. These fears put you in a negative frame of mind that practically assures failure. Former U.S. National Team defender and commentator, Alexi Lalas, commented on the difficulty experienced by players when they are pulled from a game or benched for the next game for having an “off” game. 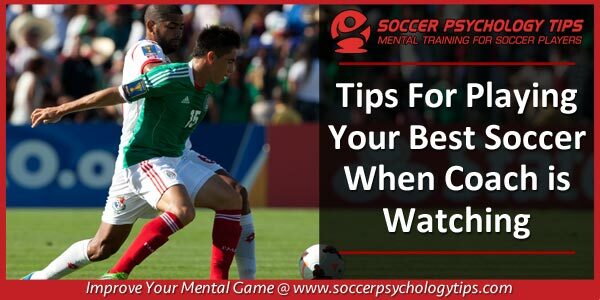 The most successful players in the world have learned to focus on what they can control… and the one thing you can control is how you approach and play the game of soccer. You must learn to control what you can control. You need to recognize the things under your direct control: your effort, your focus, your training and your play on the pitch. The most important thing to realize is that there are many things you cannot control: your coach’s opinion of you, the decisions your coach makes, how your coach reacts to mistakes made on the field, etc. You cannot control the thoughts and opinions of others. So instead of trying to please others, do what you need to do to be proud of your game.